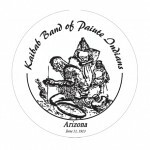 The Kaibab Band of Paiute Indians (“Tribe”) is a federally-recognized Indian Tribe organized under the Indian Reorganization Act of June 19, 1934 (codified as amended at 25 U.S.C. §§ 461, 462, 463, 464, 465, 466-470, 471, 472, 473, 474, 475, 476-478, 479). The Tribe has a tribal constitution and is governed by a seven-person Tribal Council. The Kaibab Indian Reservation (“Reservation”), which is adjacent to the Arizona-Utah border, lies within the Tribe’s vast aboriginal territory. Southern Paiute Nation v. United States, 14 Indian Cls. Comm’n 618 (1965). The Reservation was established by the Executive Order of June 11, 1913, and the Executive Order of July 17, 1917, and encompasses approximately 121,000 acres. Most of the businesses on the Kaibab Paiute Indian Reservation are owned and operated by the tribe, and include a visitor’s center at Pipe Spring National Monument, convience store/gas station, which the tribe operates, along with an RV park and campground. The tribe is also involved in agriculture, and owns an 1,300 tree fruit orchard. Because of its location in scenic northern Arizona, the Kaibab Paiute economy centers largely around tourism and the livestock industry. The only labor-intensive industry on the reservation is the tribal government, which also serves as the major employer. The reservation is surrounded by a wonderland of historic recreation and geological sights. Pipe Spring National Monument is located immediately adjacent to Tribal Headquarters, and Steamboat Rock is also situated on the reservation. Just a couple of hours drive away is the North Rim, Grand Canyon National Park, Cedar Breaks National Monument, Coral Pink Sand Dunes, Utah State Park and other scenic attractions. Lake Powell, Glen Canyon and Lake Mead National Recreation Areas are all within easy touring distance.